Bone Suckin' Sauce Thicker Style BBQ Sauce from Raleigh, North Carolina. 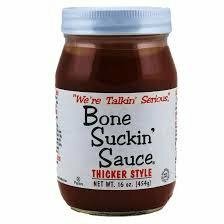 This sauce is thicker than the original Bone Suckin Sauce. Serious barbecue grilling.